One needs a holster if one is going to carry, and one of the most popular types is the OWB holster. OWB is an acronym for "outside the waistband" as this type of holster is secured to the belt and rides there. It's a highly versatile holster design, but also a huge class of products with a lot of variations, so it can be hard to pick the right one. The OWB holster is more or less the original gun holster. This was how people carried until not too long ago. The old Western gun belts incorporated the holster with the gun belt, though the holster was little more than a convex leather pouch. Some holster designs today aren't too far removed from the "Old West" style of holster, such as leather "pancake" holsters. A pancake holster is basically two pieces of material joined together with a well in the middle for the gun. They can be leather or plastic; many pancake holsters of today are made from durable, low friction plastics such as Boltaron or Kydex. There are also hybrid holsters, which usually feature both plastic and leather or other fabric materials. Hybrid holsters almost universally consist of a cloth backer and a plastic retention shell. While shells can be generic, they can also be custom-molded to fit a specific make and model. Leather holsters can likewise be tailored to fit specific makes and models of pistols. Some feature an interior plastic sleeve that fits only a specific pistol. Belt attachment is another dimension of OWB holster design. A paddle holster attachment has a large belt clip that one attaches to the belt and waistband at the point where they wish to carry it. Belt slide holsters have one's belt threaded through the holster. Naturally, it also helps to have a good, strong gun belt for carrying. In fact, it's downright necessary. Among the various gun holster designs, the OWB holster is one of the most versatile. 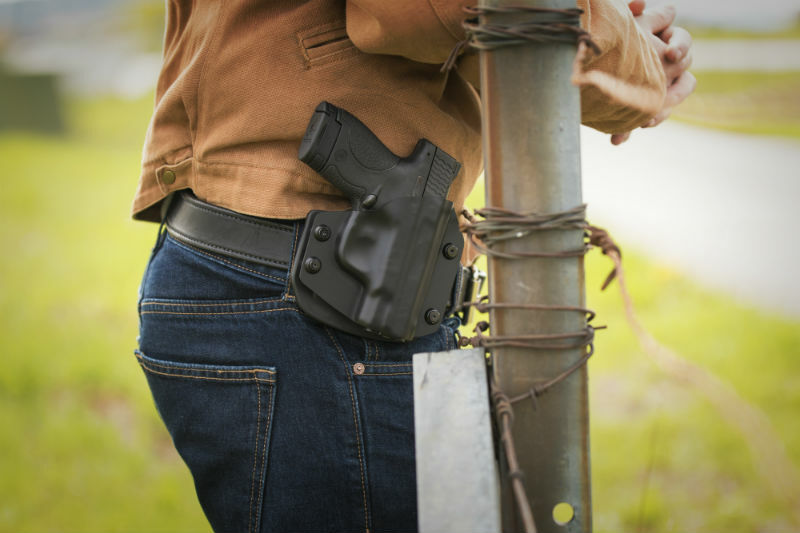 Open carry is the easiest, since that's what most OWB rigs are designed to do, and access is easier than with almost any other type of holster. Concealed carry with an OWB rig can be a bit more complicated than with other holster designs, though it's certainly possible. 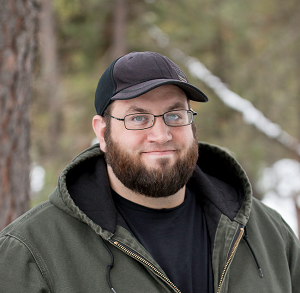 However, concealment is easy with some sort of outerwear such as a jacket or other piece of outwear. Even an unbuttoned shirt (such as flannel, because it's just manly as heck) can easily conceal an OWB holster. 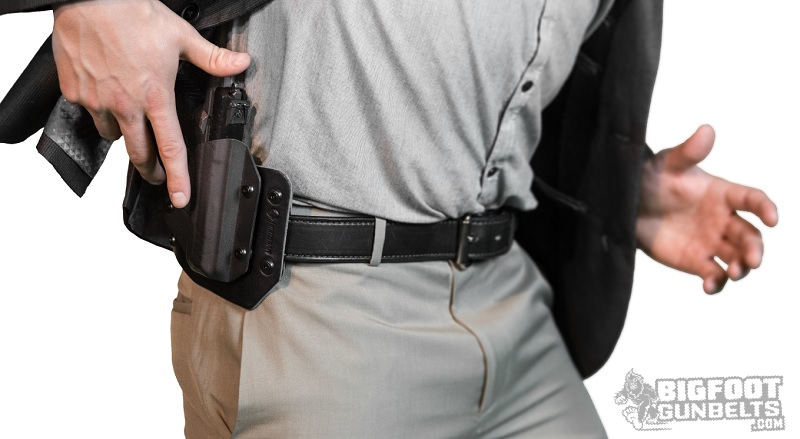 One can wear it anywhere on the belt line, so OWB holster models are available for every carry position, including the traditional 3 o'clock to 6 o'clock positions, appendix and cross-draw. When selecting any holster, whether it's an OWB holster, IWB holster or whatever, you have to know what you're looking to get. Is this something you're going to carry every day, or is this a range-day only rig? In the case of the latter, durability and retention may not be the biggest considerations, since you're only carrying a few hours per month. Plenty of cheap holsters abound for those purposes. For instance, what level of gun holster retention are you looking for? Some just want a snug fit, some want as much retention as they can get. Hybrid holsters, especially those with an adjustable retention shell, can provide a very snug fit indeed, especially those with custom-molded retention shells. Other holster designs can feature active retention devices, such as a thumb break strap. 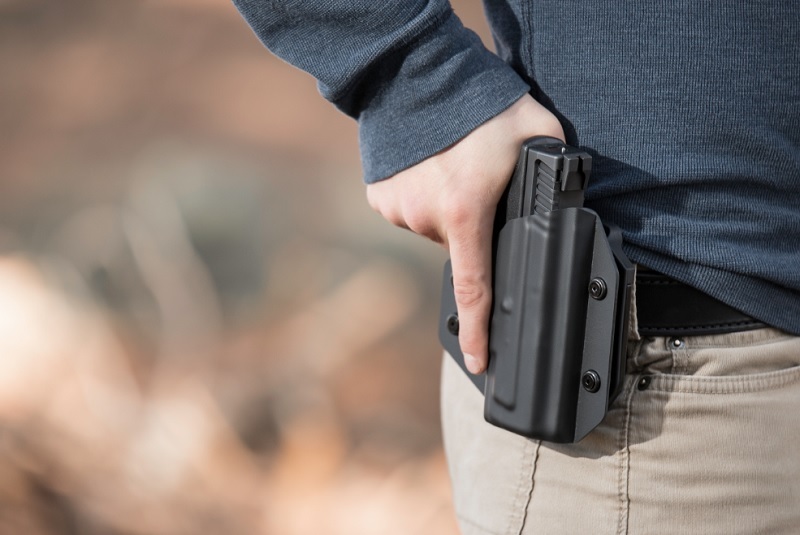 Some holsters, such as kydex duty and tactical holsters, can have several layers of retention including a thumb break and trigger guard catch. Leather holsters look the classiest, but leather pancake holsters also don't have much structural rigidity. Once you've drawn your pistol, re-holstering takes a bit more effort since the holster will wilt to a degree. A good middle ground is to find a leather holster with a plastic liner and preferably one custom molded to your make and model pistol. That way, the fit is perfect and re-holstering is easy. If ease of reholstering is concern, hybrid holsters and kydex tactical holsters will be the easiest, since they hold their shape after the weapon is drawn. Are you planning to open carry? Conceal? Mix of the two? Pay attention to ride height. Low- and mid-ride holsters are the hardest to conceal, as the muzzle protrudes further down. If you OWB carry, say, a full-size 1911 in the 3 O'clock position, the muzzle will be almost to your pocket with a low-ride OWB holster. If concealment is your goal, consider a high-ride OWB holster, as these can be more easily concealed under a shirt or outerwear. Also note the cant angle. Many are available with a vertical cant, many with the FBI cant. Some allow adjustment, so you can set the cant angle to your preference. 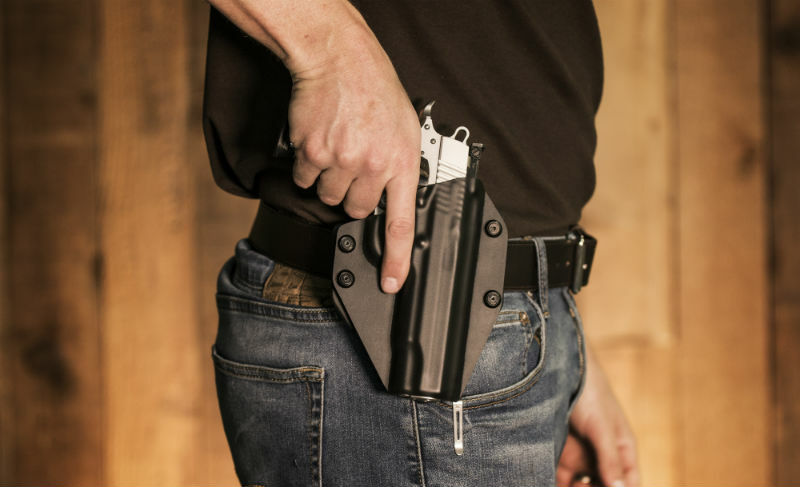 Appendix and cross draw carriers should look for holsters that can be set to a negative cant angle, as these are necessary for these positions. With so many models on the market, it's up to the carrier to decide what they want, and go from there.